﻿ Environmental probrems faced by the Earth | Let's learn about environmental probrems! Let's learn about environmental probrems! 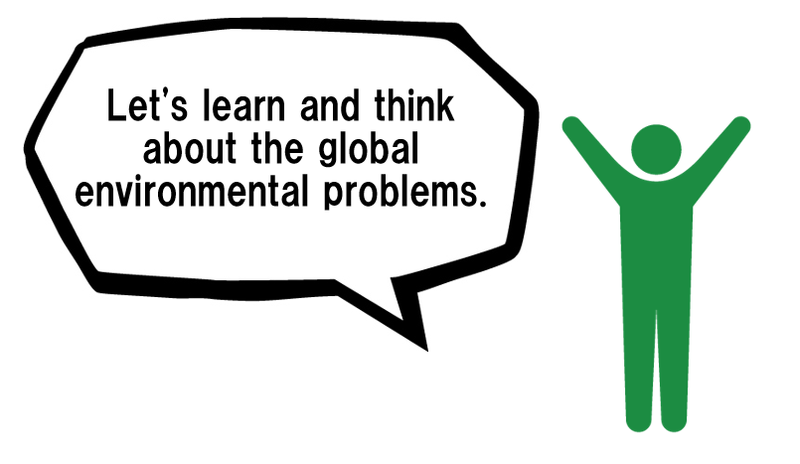 Welcome to the "Environmental problems faced by the Earth" WEB page! On this page you can learn about environmental problems that are expanding and becoming more serious all over the world now! It is an honor to think about "environmental problems" as a trigger by this page! On this web site, there is a button "NEXT ○○ (Page Name)" on each page. Follow this button to learn all the contents. ▼First of all, the site information is a route. 2017/06/02　We were upload the page. 2017/01/06　We were upload the page. 2016/12/31　We were upload the page. 2016/12/26　We were upload the page. 2016/12/24　We were upload the page. 2016/12/22　We were upload the page. 2016/12/19　We were upload the English page. 2016/12/18　We were upload the page. 2016/11/18　We were upload the page. 2016/11/17　SNS share button was added. 2016/11/16　We were upload the page. 2016/11/15　We were upload the page. 2016/11/14　We were upload the page. 2016/11/13　We were upload the page. 2016/11/12　We created a questionnaire page. 2016/11/11　We were upload the page. 2016/11/09　We were upload the page. 2016/11/07　We were upload the page. 2016/11/05　It is easier to browse the site with smartphones. 2016/11/04　We were upload the page. 2016/11/03　We were upload the page. 2016/11/02　We were upload the page. 2016/10/31　Fixed a bug on some pages. 2016/10/30　We were upload the page. 2016/10/29　We started publishing the site. It is going to be updated sequentially. You can link to this site freely. However, since pages of PDFs other than the top page may be changed or deleted without prior notice, we recommend that you use one of "http://contest.japias.jp/tqj19/190220/", "http://www.protect-earth.jp/" ,"http://contest.japias.jp/tqj19/190220/en/index.html"or"http://www.protect-earth.jp/en/index.html". This web site is participating in the contest. Copyright © 2016 Environmental problems faced by the Earth, All rights reserved.